THE MASTER DEMANDS YOUR ATTENTION! 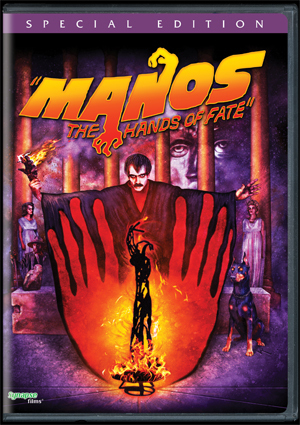 Synapse Films is proud to present Ben Solovey’s Kickstarter 2K restoration of MANOS: THE HANDS OF FATE, now presented for the first time ever, remastered for DVD and loaded with extras! MANOS: THE HANDS OF FATE, the sole directorial effort of Texas fertilizer salesman Harold P. Warren, perplexed even the most jaded Drive-In audiences and was deemed by many “the worst movie ever made”. Nearly lost, the original 16mm Ektachrome film elements have been finally unearthed and lovingly restored by Ben Solovey to create the definitive version of this accidental masterpiece. There’s no other movie like MANOS… now with picture and sound unseen since 1966.